Safe at temperatures between -40 and 212 degrees Fahrenheit, the Rubbermaid FG140P00CLR cold food pan can be microwaved and cleaned in the warewasher. Durable polycarbonate construction resists stains and odors. It has a 51⁄2-quart capacity and measures 4 inches deep. 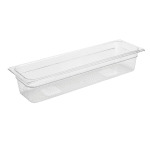 Check out our buying guide for Rubbermaid food pan to read more about this type of container.